Regardless of your personal opinion about British heavyweight boxer, Tyson Fury, nothing can be taken away from his outstanding talent that earned him an undefeated record as well as the unified WBA (Super), IBF, WBO, IBO, Ring magazine and lineal heavyweight titles. Find out more about the powerful boxer and how he was able to make a name for himself in the sport. Tyson Fury was born on the 12th of August, 1988, in Wythenshawe, Manchester to an Irish Traveller family. His father, John, who was himself a boxer, named his son after American heavyweight boxer Mike Tyson, a move that somewhat sealed his son career path. From a very young age, Fury began training as a boxer, winning various local competitions before going on to represent both Ireland and England at an international level. In 2006, Fury won a bronze medal at the AIBA Youth World Boxing Championships. The following year, he bagged the EU Junior Championship and was ranked as the third-best junior heavyweight boxer although when the time came for him to earn a place at the 2008 Beijing Olympics, he lost out to David Price. This disappointment prompted Fury to become a professional fighter having already amassed an amateur record of 31 wins (26 KO) and 4 losses. At the young age of 20, Tyson Fury made his professional debut in a fight against Hungarian Bela Gyongyosi who he beat by TKO in the first round to announce his arrival on the boxing scene. After seven fights, which he all won by knockout within the first four rounds, Fury got his first real test from fellow Englishman John McDermott in September 2009. The fight was a close one although Fury was named the winner by points in controversial circumstances. The pair went at it again in a few months, but this time, Fury knocked out his opponent to win his first title, the English heavyweight title. Fury put together a 14-0 record to get a shot at the also undefeated heavyweight fighter, Dereck Chisora, for the British and Commonwealth heavyweight titles, which he captured via unanimous decision. Fury continued to rise up the ranks, adding the Irish heavyweight title to his collection before coming up against American boxer Vinny Maddalone for the vacant WBO Inter-continental heavyweight title which he also won. In November 2014, Tyson Fury and old foe Chisora clashed again and he captured the European and WBO International heavyweight titles. This victory earned him a fight with Wladimir Klitschko in November 2015 where he surprised the world by upsetting the Ukrainian to win his WBA (Super), IBF, WBO, IBO, Lineal and The Ring heavyweight titles. 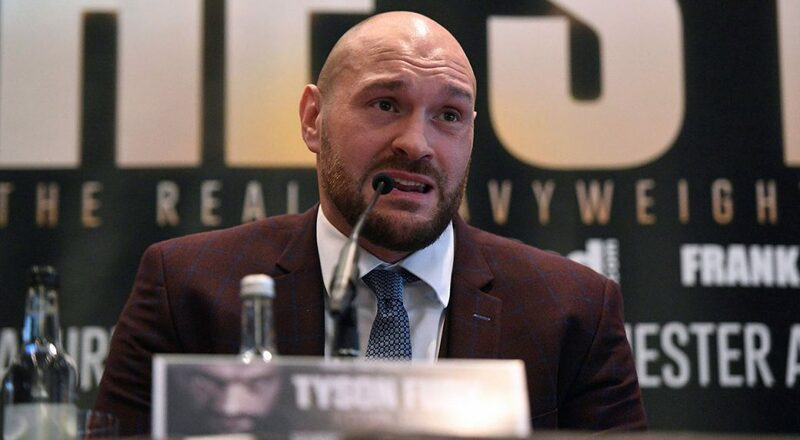 Following the victory, however, Fury became embroiled with doping allegations and substance abuse which led to his ban from the sport as his titles were stripped. In 2018, however, Tyson Fury was able to re-apply and get his boxing license back. He has been able to record two victories so far and is now scheduled to fight the undefeated American boxer Deontay Wilder for the WBC heavyweight title. Despite claims made by Tyson Fury of him being a “skint” and receiving an allowance from the British government because he did not have a job, it is reported by Celebrity Net Worth that the 2015 Ring Magazine Upset of the Year and Fighter of the Year award winner has a net worth of $20 million. Fury, who has not yet tasted defeat in 27 fights, has been able to amass such a huge net worth through sponsorship deals and payments from his various bouts. As of October 2018, his biggest payday came from his fight with Klitschko where he reportedly pocketed upwards of £3.5 million after defeating the long-reigning world champion. Tyson Fury comes from a family that has a long history with boxing. His father, John Fury, was first an unlicensed bare-knuckle fighter who later became a British heavyweight contender in 1991. His cousins are Andy Lee, a retired boxer who once held the WBO middleweight title, Hosea Burton, a former British light heavyweight champion, and Hughie Fury, the British heavyweight champion as of May 2018. He is further said to be a distant relative of undefeated bare-knuckle boxing champion Bartley Gorman who was nicknamed the King of the Gypsies, a phrase in which Fury coined his “Gypsy King” alias from. In 2009, Fury exchanged vows with wife Paris (nee Mulroy) after having dated for about four years. The couple is said to have met each other at a wedding in 2005 and almost soon after, began dating. Together, they have four children; Prince John James, Venezuela, Prince Tyson Fury II, and Valencia Amber. Read Also: Manny Pacquiao Boxing Record, Net Worth, Wife, Age, Height, Is He Gay? Tyson Fury has always found himself to be taller and bigger than most of the opponents he has come across. This is attributed to his height of 6 feet 9 inches or 2.06 m and weight of 116.57 kg or 257 pounds.